Ever since the Playskool Star Wars line was rebranded to "Galactic Heroes" and spun-off to include other Hasbro brands, there have been multi-packs. It started with repaints of existing toys, but swiftly changed to include at least one new exclusive offering. Taking that a step further, the multipacks released for Revenge of the Fallen comprise all new figures! The Fallen has returned to Earth to claim the Matrix. If he can, then the entire universe will fall to him. With Megatron by his side, he is nearly invincible. Luckily, the two most powerful Autobots on Earth are ready to stop them! "The two most powerful Autobots on Earth" are apparently Optimus Prime and Ironhide, so we'll start with them. This Prime is unique because it's the only Robot Heroes version wearing the Jetfire corpse-kibble armor. Yes, despite the fact that the toys present the two Transformers as "combining," that's not really what happens. Combiners are robots who join together, then separate again when they feel like it. Jetfire had his dying body ripped apart and metaphorically sold for scrap. 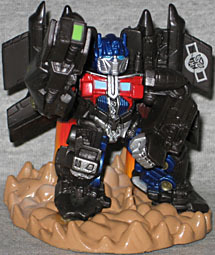 Since he's draped himself in bodyparts like a robotic Ed Gein, "Jetpower Optimus Prime" is very bulky. He's not a small bot to gein with, and now he has larger pieces wrapped around his legs and arms. The proportions of his head and chest have been cheated, a bit, to keep him from looking like a microcephalic He-Man figure. There's a large gun on his left arm, and a massive cannon on his right. Jetfire's wings are on Optimus' back, and the jet engines are blasting forth with flame. The figure moves at the shoulders and head. One of the ways Hasbro is creating new versions of the Transformers for these boxed sets is something that would never work for other properties: they're giving us the TFs in their altmodes. 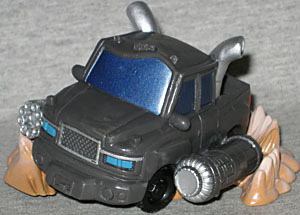 So the Ironhide in this set is actually just a grey pickup truck. The truck is a single hollow piece, no moving parts, but it's still been sculpted in the Robot Heroes style - namely, it's rounded, cutesy and generally a super-deformed presentation. Really, this looks like something you would have seen in Cars; the windshield even has a "brow" raised to give the vehicle some personality. 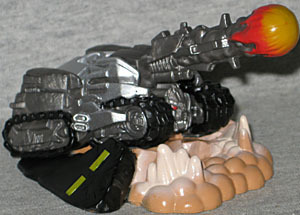 Of course, none of the cars in Cars had giant weaponry hanging off their sides, but Ironhide does. His silver exhaust pipes curve out to the sides, and there's a patch on the tailgate that looks like it was designed for a squshed Autobot symbol, but there's just a normal one painted back there. 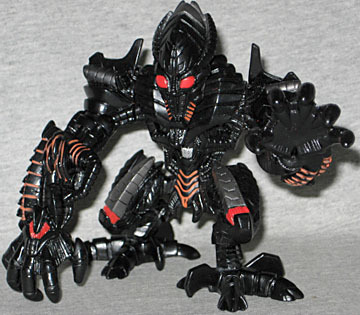 Megatron has already had two ROTF Robot Heroes, but here's #3! This one, like Ironhide, is in vehicle mode, so this is our first RH Megatron tank. The tank is silver and grey, with a bright orange blast escaping from the barrel and trailing grey smoke. Megatron doesn't look as "deformed" as Ironhide does, but that's simply because he's not a real object, so there's nothing to easily compare him to. Amusingly, Megatron's angry little face is visible peeking out from between the front treads. For some reason, there's a chunk of paved road breaking off next to him - it's black, with yellow stripes. Rather than stock these sets with all normal-sized robots, Hasbro is taking the opportunity to release bigger toys, and in this set, that's The Fallen. Yes, Mr. Big and Flaming himself, done in a cute and cuddly style. Aww! The detailing here matches up with what we've seen on the other toys, though the "tendons" that should run between his waist and elbows instead take a 90° bend and go into his armpits. At 4¼" tall, he's not as big as the Superhero Squad biggies, like the Sentinel or Fin Fang Foom, but he still dwarfs the other Robot Heroes in this set. The Fallen is squatting with one hand just brushing the ground, and he moves at the neck and shoulders. For some reason, the "Egyptian headdress" part of his head is sculpted on his body, acting more like a frill on his neck than a part of his face. He looks fine as long as his head is in a neutral position, but twist it a bit, and things start to fall apart. The figure is mostly black, as he should be, but there's also appropriate silver/gray detailing on his legs, shoulders, head and spine. His eyes are large and rounded, rather than thin slits, but that just fits with the Robot Heroes aesthetic. There is plenty of orange paint spread around, too, to mimic the internal fires that drive The Fallen. The largest portions (other than the eyes) are on the knees and the backs of the hands, but he's also got thin glowing cracks on his arms, jaw and crotch. The Battle of The Fallen set is sold in the usual "amphitheatre" packaging, with a desert backdrop - fitting, since the fight depicted took place in Egypt. There are two pyramids and a ruined collonnade decorating the scene, and a cardboard platform lifts Prime up a bit higher than the two vehicles. It's a decent diorama, but not really worth hanging onto forever. Enjoy it for a while, then pitch it. If there's one downside to these Robot Heroes box sets, it's the way Hasbro insists upon surrounding the figures with big plumes of dust. Prime, Megatron and Ironhide all have these large "cloud" bases that give the toys an increased footprint. Megatron's looks like he just knocked down a wall, Ironhide's suggests he's spinning out, and Jetpower Prime's just looks like he's getting ready to take off like the space shuttle. All of those are appropriate, sure, but I just don't like them. Despite that, Battle of The Fallen is a good set. You get The Fallen, of course, plus a fully unique Optimus Prime. Megatron's tank is okay, and the Ironhide may be lackluster, but at least there's nothing particularly bad about him. There are definitely worse ways to spend your money on Transformers.